Was riding at 6mph up a smooth hill. Stopped to re-seat my computer on bars. Started up again and heard a bang and lurched as the wheel started rubbing. Thought it was a broken spoke. Nope, broken chainstay. Was in my 34/21. Annoying, but warranty should cover it. 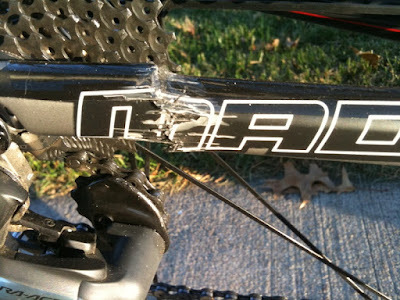 let us know about the warranty, heard a few horror storie of trek not covering frames that have snapped at chainstay. I've heard tell of front Di2 ders bending front chain rings due to the der being mounted too low... but just can't formulate a non-impact scenario for this. I agree with James, "c'mon..."
People who'd blame this on shifting without pedaling are either badly out of touch with the modest amount of force a derailleur can exert, or else think the bikes they sell are so fragile it's pathetic. I'm a former wrench too, and currently an engineer. I had a similar thing happen to my '07 Madonne 6.2 (different frame platform same carbon material) No fall, no trauma and the left seat-stay breached and buckled. Trek pushed back a bit but after further investigation they did the right thing and gave me a new '09 Madonne. In general Trek are very good about making sure the customer is loyal and happy. I didn't shift or do anything out of the ordinary. I was riding up a hill in my 34/21. Stopped because my computer was loose in the mount. Re-secured the computer and then started to pedal again when it went Bang. No shifting, nothing. Trek pushed back but did give me a new frame and the bike was built back up 4 days later. No crash, no impact, the bike was basically brand new. Didn't even have a scratch on the paint. My own guess is there was a defect in the part and it was a little thin somewhere. The stress built up riding up the hill and it broke. Wonder what it would have been like if it would have failed in a race during the sprint. Glad I didn't find out! I'd love to know what Trek finally finds out about the frame but I am sure I'll never be told.